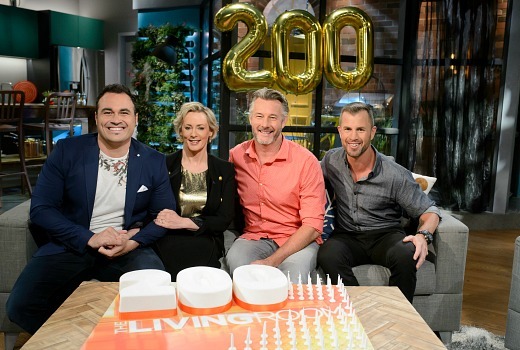 The Living Room reaches its 200th episode tonight, but Dr. Chris Brown misses out on cake (he probably wouldn’t eat it anyway!). Hosts Amanda Keller, Barry Du Bois and Miguel Maestre are joined by Shannan Ponton, standing in for Dr. Chris, who is away in South Africa. The WTFN production was originally commissioned under former Programmer David Mott as a way of showcasing lifestyle in a different format, against the might of Seven’s Better Homes and Gardens. It is now in its 6th season with two Logie wins as Most Popular Lifestyle Program. Together with Graham Norton, it has been pivotal in TEN turning around years of under-performing Friday numbers. It is a children’s special on The Living Room tonight and Barry, Miguel and Shannan have a series of stories designed to please the whole family. Barry renovates the bedrooms of two young girls who are in desperate need of more storage, Miguel shows a group of kids how to cook vegetable spaghetti and Shannan takes his son Max on an action-packed, family day out for just $5. Chris sends a special message for the team all the way from the African jungle, guest experts Kyal and Kara drop by the studio with their three-month-old baby Ziya and Barry, Miguel and Shannan pull out all the stops to impress the audience with a children’s themed HOT or NOT. Gather the family and join television’s favourite hosts as they celebrate 200 episodes with a lot of laughs, great banter, good company and a grand celebratory cake. I’ve always had a soft spot for this show – its The Little Show That Could. 7:30 Friday is traditionally where TV shows go to die but this one just keeps on keeping on. Its super lightweight but it just works. It’s always seemed like Amanda could not care less about the content of the show but still manages to charm the audience and her guests in pretending she does. Haha you are spot on. I’d love to see her doing Gogglebox and watching and commenting on their show. I don’t doubt there’d be a lot of eye rolling and facetious commentary. Still the show is light and fluffy and doesn’t really take itself seriously and that’s its charm.